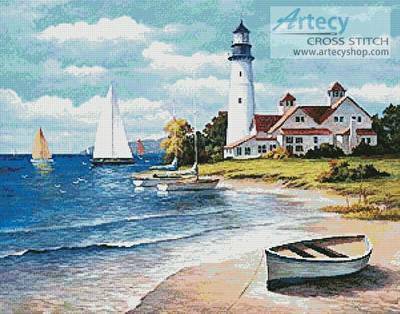 Lighthouse Bay cross stitch pattern... This counted cross stitch pattern of a Lighthouse and Beach Scene was designed from the artwork of T.C. Chiu. Original image copyright of T.C. Chiu and Cypress Fine Art Licensing www.cypressfineart.com. Only full cross stitches are used.